This tool is used in industry to determine the Hardness of a material according to the Mohs scale. The kit contains 8 different Mohs' Hardness Points, from Mohs 2 through Mohs 9. These points are used in a 'scratch test' on the material. For example, if the number 6 point scratches a particular material, but the number 5 point does not, then your material has a Mohs' Hardness value of about 5.5. A common use of this tool is in Concrete Hardness Testing to guide the technician in selecting the optimal abrasive to use in the concrete polishing. Other examples of industrial use of this Mohs' Hardness Test Kit - on touch screens, faucet finishes, and countertop materials. 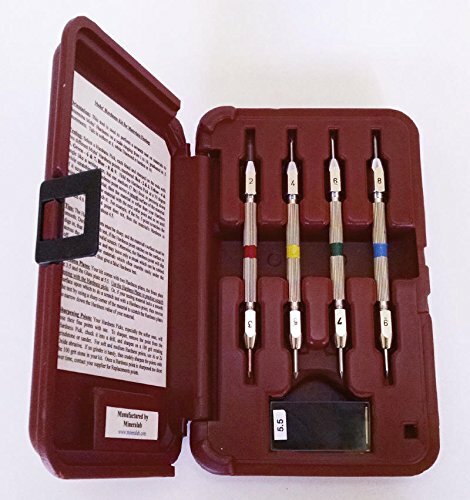 This kit comes packaged in a rugged molded Plastic Case with permanent Instructions, along with a Mohs' Hardness Table of common natural and man-made materials. The Hardness Points are made of Metals and Alloys of equivalent Mohs' Hardness as the mineral standards, so the points will not break off, and they can easily be re-sharpened, and ultimately replaced after many years. This beautiful and thoroughly conceived tool is made for the opposite of "planned obsolescence". If you have any questions about this product by Mineralab, contact us by completing and submitting the form below. If you are looking for a specif part number, please include it with your message.